62 Full Colour Pages. Tons of Exercises! 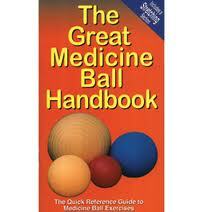 This handbook gives the user a series of different medicine ball exercises to do alone or with a partner. While the focus is on the core muscles, it also has exercises to work the whole body. As with all the "Great" books it addresses proper instruction and safety concerns. Other sections include; rotator cuff exercises, stretching, a sample routine, and muscle anatomy diagrams. This how-to book gives a complete body workout with start and finish photos and easy to follow, step-by-step, instructions.